UPDATE: Samsung Electronics America has announced today that around half of all the Samsung Galaxy Note 7 units sold in the US have now been exchanged through its voluntary recall program. Of those customers, 90 percent have opted to receive replacement Note 7 units, while the rest presumably asked for a refund. Samsung has announced that 500,000 replacement Galaxy Note 7 handsets have been shipped to US stores to be made available from September 21. The company hasn't had the easiest time recently, having voluntarily issued a recall for its US Note 7 devices after reports of a major battery flaw on September 2. Following this recall, the US Consumer Product Safety Commission issued its own official recall for all Note 7 phones sold before September 15. 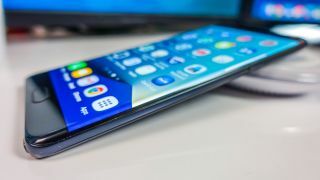 Around one million devices have been recalled in the US and this first major shipment of new handsets will replace half of them. The new phones will come with a software update which will feature a green battery icon in the top right corner of the screen to indicate that it is, indeed, a new and safe version of the handset. Not all of the risk-posing Note 7 phones have been returned, however, so Samsung will also push out another software update to recalled devices to encourage their owners to exchange them. When the update is installed, users will be presented with a recall notice prompting them to shut down their device and exchange it. The notice will appear every time the user turns on or charges their phone so it'll be pretty hard to claim that you missed it. For anyone thinking about getting a new phone and holding out for a Note 7 that doesn't pose a fire risk, it's looking likely that US sales will restart on October 21. While those in the UK will have to wait longer with Samsung suggesting November. Samsung's chief marketing officer in Europe, David Lowes, told Reuters, "We fully expect (new Note7s) to be available everywhere by the end of November ... well before the end of the fourth quarter."